Количество: Базова цена: 229,90 лв. 14 Hexagonal metric sockets: 13, 14, 15, 16, 17, 18, 19, 20, 21, 22, 24, 27, 30 and 32mm. 5 Long hexagonal metric sockets: 16, 17, 18, 19 and 22mm. 3 Torx sockets: E20, E22, and E24. 1 72-tooth ratchet with socket ejector. 2 Extension bars: 125 mm and 250mm. 1 3/8" female part - 1/2" male part adapter. 2 Spark plug sockets: 16 mm and 21mm. 2 Screwdriver handle heads: Torx: T70 and Allen 14mm. 7 Allen keys: 1.27, 1.5, 2, 2.5, 3, 4 and 5mm. 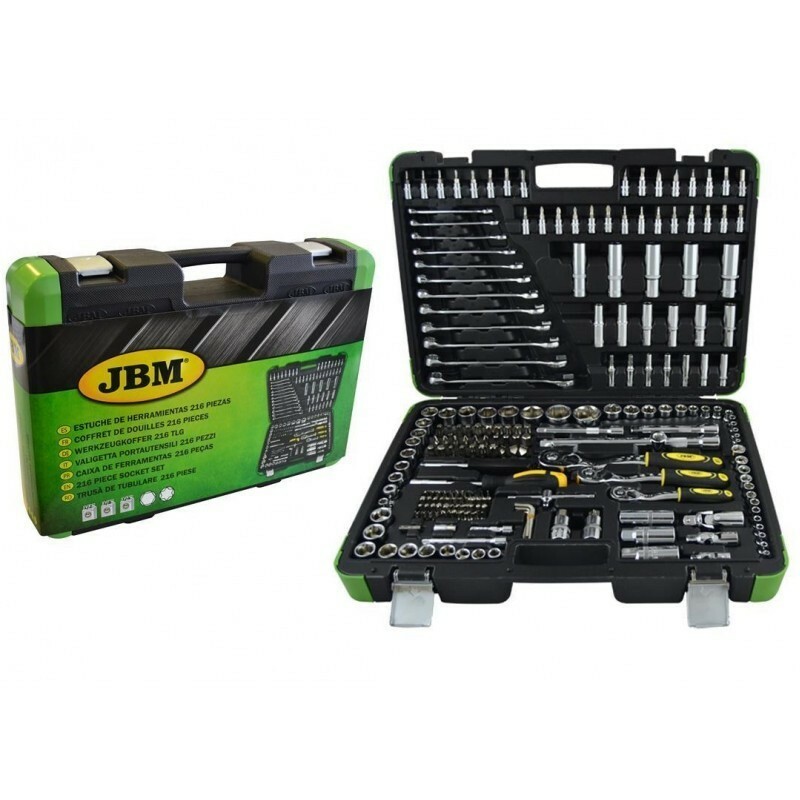 12 Combination spanners: 8, 9, 10, 11, 21, 13, 14, 15, 16, 17, 18 and 19mm. 13 Hexagonal metric sockets: 4, 4.5, 5, 5.5, 6, 7, 8, 9, 10, 11, 12, 13 and 14mm. 7 Long hexagonal metric sockets: 4, 5, 6, 7, 8, 9 and 10mm. 5 Torx sockets: E4, E5, E6, E7 and E8. Double Phillips: #0, #1 and #2. Allen: 3, 4, 5 and 6mm. Flat: 4, 5.5, 6.5 and 7 mm. Torx: T8, T9, T10, T15, T20, T25, T27 and T30. Torx tamperproof: T8, T9, T10, T15, T20, T25, T27 and T30. Allen: H2, H2.5, H3, H4, H5 and H6. Torx: T5, T6 and T7. Ribe tip: M5, M6, M7, M8 and M9. 12-point: M5, M6 and M8. 10 Hexagonal metric sockets: 10, 11, 12, 13, 14, 15, 16, 17, 18 and 19mm. 6 Long hexagonal metric sockets: 10, 11, 12, 13 and 15mm. 6 Torx sockets: E10, E11, E12, E14, E16 and E18. 1 125 mm extension bar. 1 18 mm spark plug socket. Allen: H7, H8, H10 and H12. Flat: 8, 10 and 12 mm. Phillips: #2, #3 and #4. Double Phillips: #2, #3 and #4. Torx: T40, T45, T50, T55 and T60. Torx tamperproof: T40, T45, T50, T55 and T60. Ribe tip: M10, M11, M12 and M13.